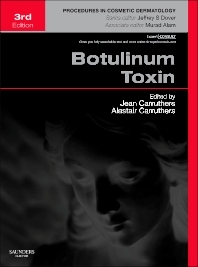 Botulinum Toxin, a volume in the Procedures in Cosmetic Dermatology Series, helps you keep up with the growing demand for non-invasive procedures and provide the optimum results your patients expect. Evidence-based, procedural how-to's and step-by-step advice on proper techniques, pitfalls, and tricks of the trade equip you to successfully incorporate the very latest botulinum injection techniques into your busy practice! Dr. Alastair Carruthers is a Cosmetic Dermasurgeon who operates his own clinical practice (Carruthers Dermatology Centre Inc.) in Vancouver, BC. He is also a Clinical Professor of Dermatology with the Faculty of Medicine at the University of British Columbia (UBC). During his 20 years of practice, Dr. Carruthers has made several major contributions to the field of dermatology. Foremost among these was the use of the BOTOX® procedure in cosmetic applications, a discovery he made with his wife, Dr. Jean Carruthers, in 1987. Since this time, they have been at the forefront of BOTOX® research, development and education, publishing numerous articles using their data. Today, BOTOX®, which inhibits nerve impulses in muscles that cause everything from frown lines and wrinkles to sweating, is the most commonly performed cosmetic procedure in the world. Dr. Carruthers has also made significant advances in the area of Tissue Augmentation. These materials, both temporary and permanent, are used to lift and support the structures beneath the skin. In 1998 Dr. Carruthers was the first dermatologist in North America to begin injecting Artecoll. Through the extensive research performed in their Vancouver based facility, Drs. Carruthers continue to have articles published and lecture extensively on these subjects. With over 100 published articles to his credit, Dr. Carruthers is a member of the Editorial Board of “Dermatologic Surgery”. He is also a member of several national and international associations, including the American Dermatology Association and the Canadian Dermatology Association, where he served as President from 1998 to 1999. In addition, he has been elected Vice President of the American Society for Dermatologic Surgery. Dr. Carruthers has also contributed extensively to studies about the relationship between skin cancer and sun exposure. Dr. Jean Carruthers, MD, FRCS (UK), FRCS (C), Diplomate of the American Board in Cosmetic Surgery, Fellow of the American Society of Ophthalmic Plastic and Reconstructive Surgery. Dr. Jean Carruthers is a Cosmetic Surgeon and a Clinical Professor of Ophthalmology with the Faculty of Medicine at the University of British Columbia (UBC). Dr. Carruthers has lectured worldwide on a variety of subjects pertaining to cosmetic ophthalmology, including the cosmetic use of the BOTOX® procedure, which she co-founded with her husband, Dr. Alastair Carruthers, in 1987. Since this time, they have remained at the forefront of BOTOX® research, development and education, publishing numerous articles using their data. BOTOX® inhibits nerve impulses in muscles that cause everything from frown lines and wrinkles to sweating. Today, BOTOX® is the most commonly performed cosmetic procedure in North America. They are now also researching the cosmetic use of the newest therapeutic neurotoxin, Botulinum type B, commercially produced as MyoBloc. Dr. Carruthers has published more than eighty peer reviewed scientific articles and twenty-eight scientific book chapters on a variety of topics, including the use of botulinum toxin and soft tissue augmenting agents, aesthetic lasers and cosmetic laser blepharoplasty. She is an International Editor for such publications as Dermatologic Surgery, the Journal of Cosmetic Laser Surgery and the American Journal of Cosmetic Surgery.